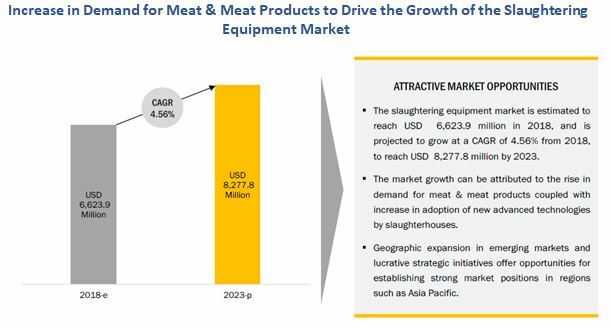 [146 Pages Report] The global slaughtering equipment market was valued at USD 6.39 Billion in 2017; this is projected to grow at a CAGR of 4.56% from 2018, to reach USD 8.28 Billion by 2023. The objectives of the report are to define, segment, and estimate the size of the global slaughtering equipment market, in both quantitative and qualitative terms. Furthermore, the market has been segmented on the basis of type, process type, automation, livestock, and region. The report also aims to provide detailed information about the crucial factors influencing the growth of the market, strategical analysis of micro markets, opportunities for stakeholders, details of the competitive landscape, and profiles of the key players, with respect to their market shares and competencies. This research study involved the extensive use of secondary sources (which included directories and databases) such as Hoovers, Forbes, Bloomberg Businessweek, and Factiva to identify and collect information useful for this technical, market-oriented, and commercial study of the slaughtering equipment market. The primary sources that have been involved include industry experts from the core and related industries and preferred suppliers, dealers, manufacturers, alliances, standards & certification organizations from companies, and organizations related to all the segments of this industry’s value chain. 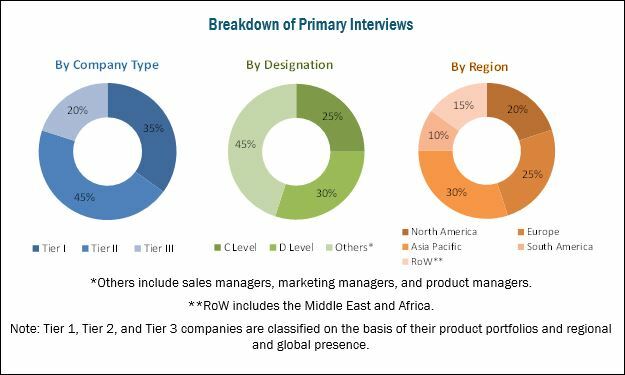 In-depth interviews have been conducted with various primary respondents, such as key industry participants, subject matter experts, C-level executives of key market players, and industry consultants, to obtain and verify critical qualitative and quantitative information as well as to assess future prospects. The following figure depicts the market research methodology applied in drafting this report on the slaughtering equipment market. The key manufacturers in the slaughtering equipment market include Marel (Iceland), BADDER Group (Denmark), BAYLE SA (France), Prime Equipment Group (US), and CTB (US). These companies have diversified product portfolios and advanced technologies for slaughtering equipment at major strategic locations. The other companies which are profiled include Brower Equipment (US), Jarvis Equipment (India), Industries Riopel (Canada), ASENA (Azerbaijan), Dhopeshwar Engineering Private Limited (India), Meatek Food Machineries (India), BANSS (Germany), Limos (Slovenia), Best & Donovan (US), and Blasau (Spain). 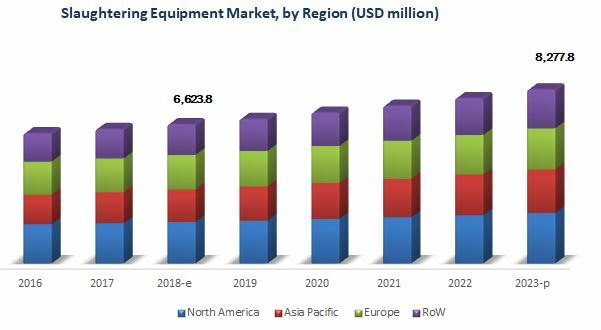 The slaughtering equipment market is projected to reach USD 8.28 Billion by 2023 from USD 6.62 Billion in 2018, growing at a CAGR of 4.56%. Increase in demand for processed meat, lenient trade policies, and an increase in meat exports are some of the major factors that are expected to drive the demand for slaughtering equipment. Based on livestock, the slaughtering equipment market has been segmented into poultry, swine, bovine, seafood, and others, which include ovine and caprine. The poultry segment dominated the global market for slaughtering equipment in 2017, and this trend is expected to continue through the forecast period. The demand for poultry has been growing significantly worldwide, which led to an increase in demand for poultry slaughtering equipment such as killing, cut-up, deboning & skinning, and evisceration equipment. Most large-scale poultry meat producers use automated poultry slaughtering line for high capacity production. On the basis of automation, the slaughtering equipment market has been segmented into fully automated line and semi-automated line. The semi-automated line method segment dominated the global market for slaughtering equipment in 2017. Semi-automatic slaughtering lines consist of some automatic machines as well as manual labor-oriented processes during slaughtering. Semi-automated lines have lower initial investments and require low maintenance costs, which are its main advantages over automated slaughtering equipment. Asia Pacific is projected to be the fastest-growing region in the global slaughtering equipment market during the forecast period, owing to the rise in meat consumption, population growth, and increase in awareness about quality and hygienic meat products in the region. High consumption of meat in urban areas and the increase in demand for processed meat products drive the growth of the market for slaughtering equipment in the region. Market consolidation is one of the major factors restraining the growth of the slaughtering equipment market, globally. The slaughtering industry has been experiencing consolidation during the last few decades (20-30 years), which has had a relative effect on the slaughtering equipment industry. Globally, leading slaughterhouses process a large number of livestock with their high production capacity slaughtering equipment; this results in low cost of production per unit when compared to the small and local slaughterhouses. The key players in the global slaughtering equipment market include Marel (Iceland), BADDER Group (Denmark), BAYLE SA (France), Prime Equipment Group (US), CTB (US), Brower Equipment (US), Jarvis Equipment (India), Industries Riopel (Canada), ASENA (Azerbaijan), Dhopeshwar Engineering Private Limited (India), Meatek Food Machineries (India), BANSS (Germany), Limos (Slovenia), Best & Donovan (US), and Blasau (Spain).